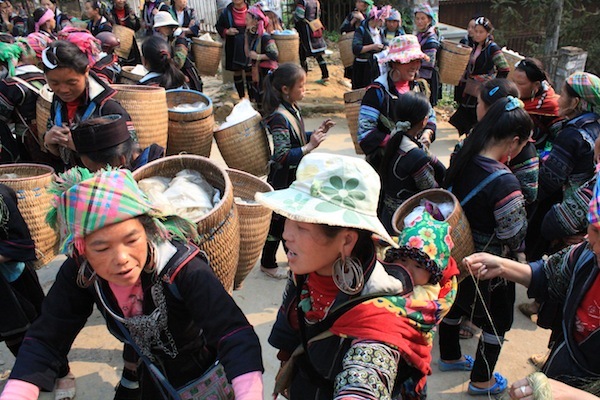 Sapa is a remote town north of Hanoi that is very popular among trekking crowds for the stunning scenery and the interaction with the local minority villagers. 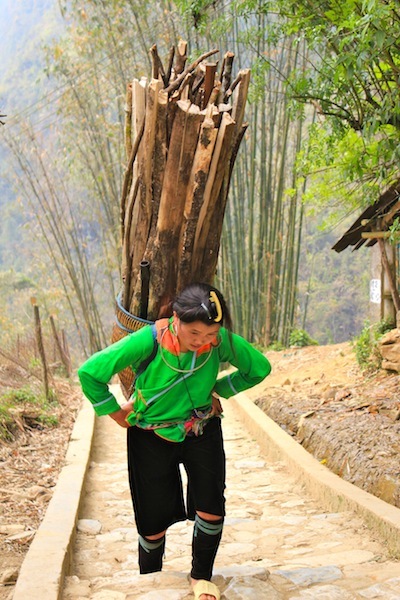 The village of Sapa itself is not dissimilar to a town you would expect to find nestled high in the Swiss Alps in some respects… the high altitude, tall pine trees and mountains looming on all sides. … the villagers eagerly await the flood of tourists to begin pouring out of their hotels & commence their daily treks – in the hope of selling a few handmade trinkets & keepsakes from their woven baskets. The villagers themselves, in their bright traditional uniforms are a friendly bunch and surprisingly most speak excellent English – a by product of interacting with tourists everyday. 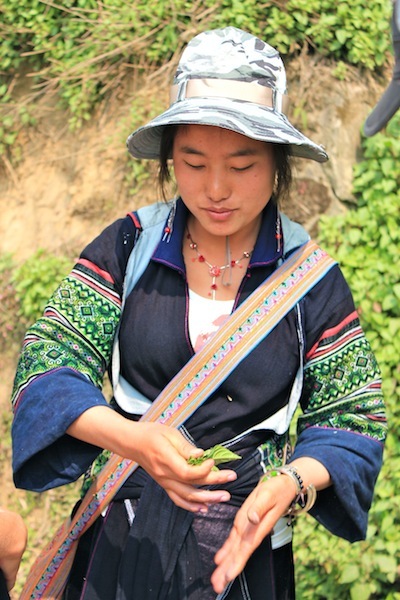 Our local guide… Bau, a young girl from the local Hmong tribe was the perfect guide… endowed with a bubbly personality and endless energy. 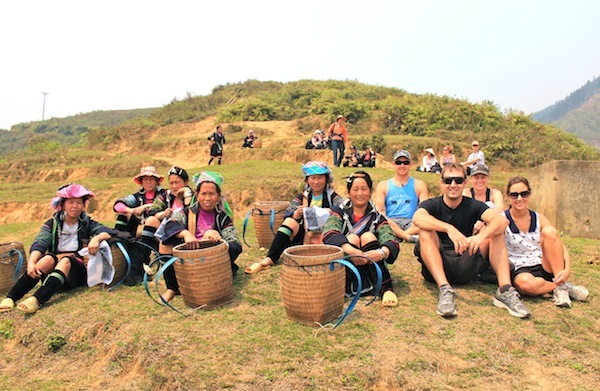 We set off on foot in the direction of Bau’s village… and were joined by a few other villagers as we made our way out of town and into the seasonally arid countryside of Northern Vietnam. 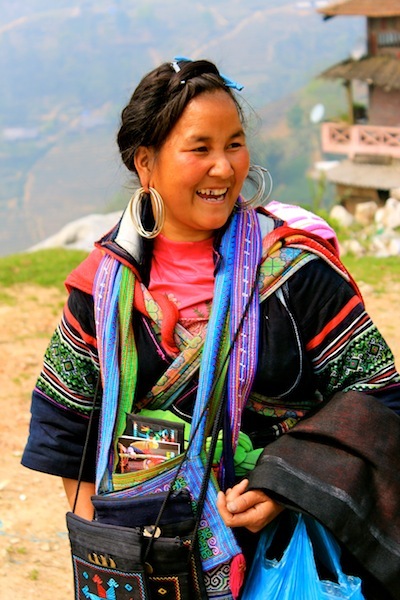 The woman who joined our little trekking party were some of Bau’s fellow villagers… women who weave & dye fabric in extraordinary colours, which they then use to skillfully produce clothing, wristbands, scarves & other items to sell to tourists and make a few extra dollars. 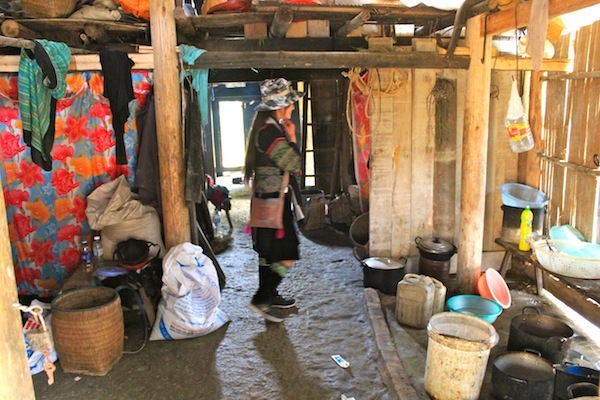 With our first hour of trekking behind us – Bau asked if we would be interested in paying a visit to her family home to see how her and her family lived? We strayed from the main trekking path & after a few metres came across Bau’s family home… a simple timber structure with a couple of rooms (no doors) and a dirt floor. The first room contained a small kitchen area where Bau and her family prepare all their meals. No more than a bunch of plastic tubs and some various cutlery – the modern world has not yet found it’s way into Bau’s kitchen. 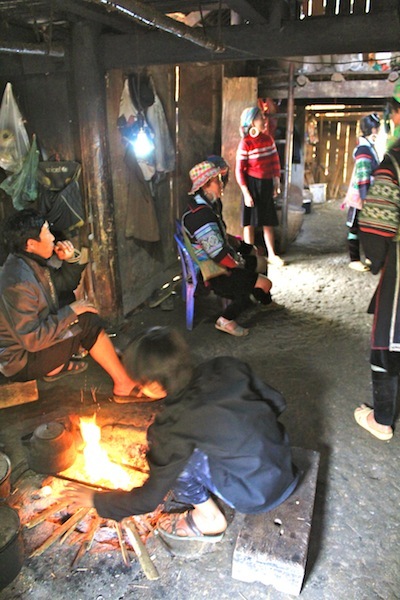 Basic tools that we take for granted in our lives like refrigeration, gas and other electrical appliances are all luxuries that do not exist in the day-to-to life of this hill tribe family. … both huddled around a open fire, her father generously raising his traditional tobacco pipe towards me as we were introduced… gesturing for me to take a smoke. I kindly declined and thanked him for the opportunity to see how his family lived. 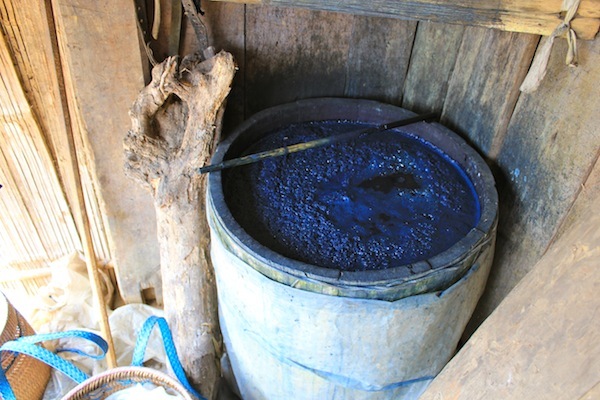 Outside of the home, Bau led us to a large container filled to the brim with bright blue liquid… the contents being a dye made from natural plants grown in the area… this was the very same dye they use to colour their bright blue clothing. We had discovered by this stage in the day that one of the villagers accompanying us… possessed a wicked sense of humour. When I was out of earshot, she encouraged Brent, a friend who was joining us on our trek, to dip his finger in the dye… then wipe it across my face (I don’t think it took much encouragement) leaving me looking like a smurf for the rest of the day. 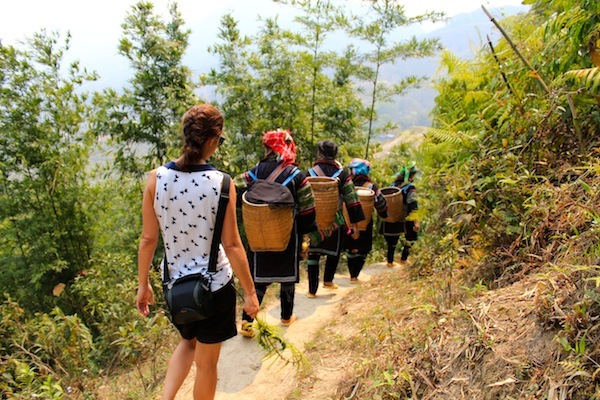 We thanked Bau’s father once again and continued our trek deeper into Sapa’s remote villages. The trekking path itself was primarily downhill, mostly dirt & fairly easy to negotiate. The scenery provided more than enough eye candy to keep our eyes busy, the area is home to some of the largest rice paddy fields I have ever seen… unfortunately the time of year we were there was not crop season so the rice paddies were bare. How they choose a husband…? What were their husbands doing while they were out working…? … and on and on it went for most of the day when we found ourselves with spare breathing capacity. … multitasking as we sat and chatted about life in general. 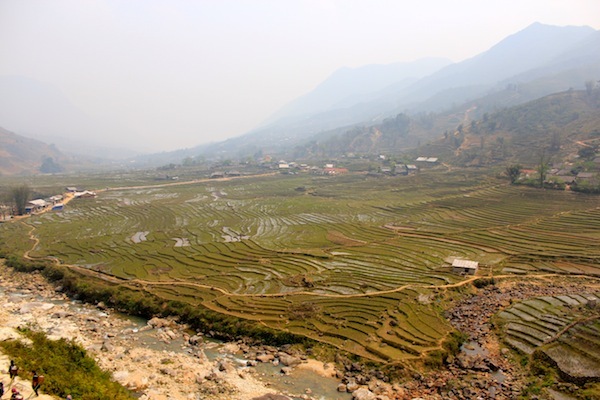 After maybe an hour longer of trekking… we came to a stone quarry that offered amazing panoramic views over a massive area of rice paddies below, and the village we would be climbing down to & making a lunch stop. We each selected a small item from the women’s baskets in exchange for a few dollars (more a token of appreciation for spending the day with us and educating us about their local ways) and wished them good luck. Met by a swarm of new women from a different tribe… the usual balancing act ensued – politely trying to convey that we simply didn’t need anymore bags, wristbands or bracelets… whilst endeavouring not to insult anybody. 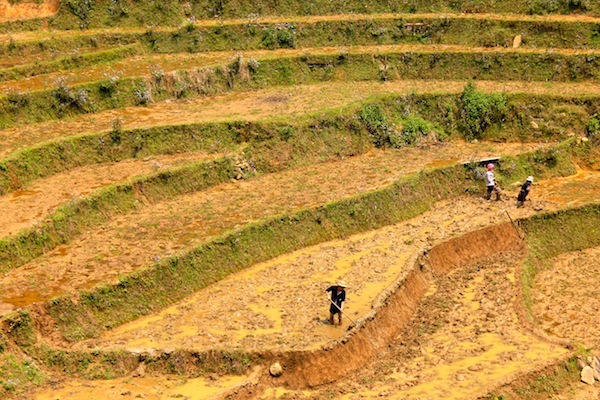 And after a quick bite – we were off again for another 40mins or so through the village we had looked down upon from the stone quarry… and over the river to a waiting van & the end of our first day of trekking in remote Northern Vietnam. With it’s dirt floor and walls & ceiling blackened from years of cooking over the open fire, and pondering how hard it must be for a teenage girl living in a home without even an ounce of privacy from her family. Letting go of the typical modern life… the constant striving for the bigger house, the newer car, and settling into a simple mountainous existence… perhaps running a local bar or coffee shop? If you stay at the Red Dragon Hotel in Hanoi – they’ll do all the hard work for you… the hardest part of your job will be remembering to be back at the hotel before your train leaves. My boyfriend and I are planning our trip to Vietnam, and really want to do a trekking tour like the two of you did. Do you perhaps remember who you did your tour through? It would help a lot with the planning – there are soooo many options on Google and the one you did sounds awesome! 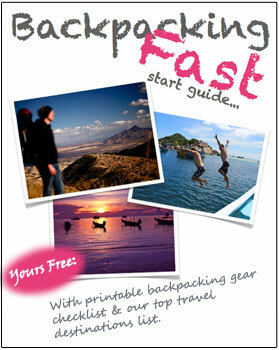 Awesome news about your upcoming trip! unfortunately, our tour of Sapa was organised by the hotel we stayed at in a Hanoi – The Red Dragon, so I have no idea what the company was even called. Sorry I can’t be more helpful. Highly recommend the Red Dragon if in Hanoi! Previous post: Ancient Angkor Wat… It’s Old. It’s Big. But Is it Really Worth All The Hype? Next post: A Ha Long Bay Long Shot – Will Our Second Attempt At Cruising Vietnam’s UNESCO World Heritage Site Pay Off?